This game was made for the Game Makers Toolkit Game Jam (2017). 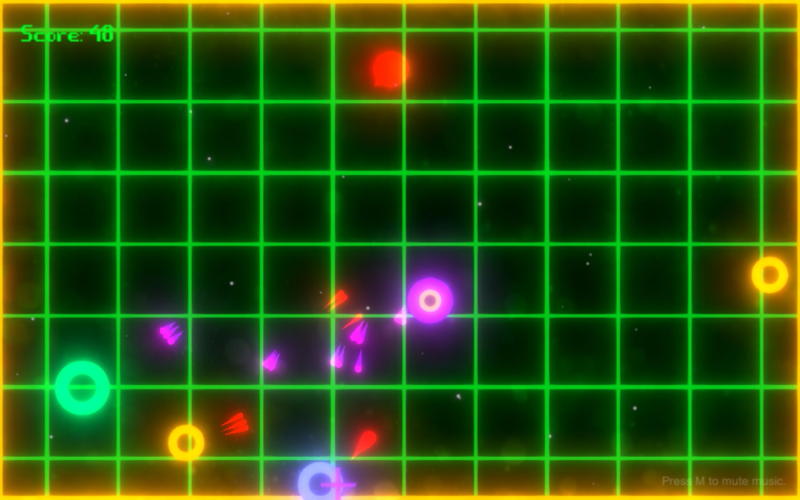 A bullet hell game where you literally become your enemy. Upon killing an enemy you teleport to their position and gain their abilities. Be careful with the order you kill enemies in; different enemies are more effective in different circumstances, you don't want to be caught out. How does your submission match the theme? The game is built around the idea that shooting an enemy not only scores points and removes them but also makes the player 'become' that enemy; teleporting to its position and gaining its weapon. In addition to removing the enemy and building points shooting enemies serves a multitude of other puposes; Teleports the player; helping the player to avoid projectiles (any nearby projectiles are detroyed). Changes the players weapon; giving importance to the order in which enemies are killed. Builds combo; forcing the player to act agressively. This game was made in Unity3d, what little sprites there were were made in Photoshop. Music and sound effects were made in LMMS using the SFXR and Nescaline plugins.